I am addicted. I have made my confession before. Confessions of a Scrabble Addict! I have tried hard to overcome it but I have not been able to do so as I reported in My Addiction has Returned. And now this year it has taken 27 days of my life. We played 216 games in 2017. It takes us about 3 hours to play a game. So that amounts to 27 days playing scrabble. 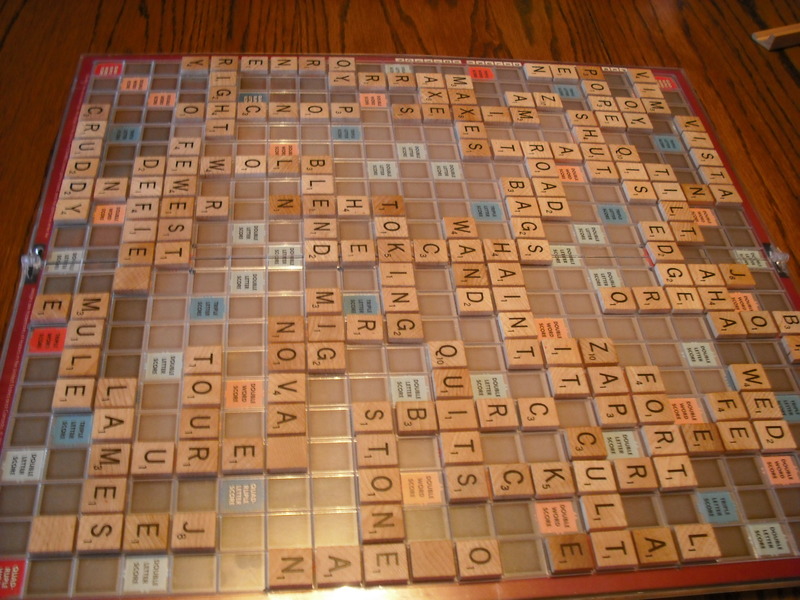 We play on a super scrabble board which has twice the letters of regular scrabble and an expanded board. We also take forever to take a turn because we are so competitive and try to either play a seven letter word which gives us 50 extra points or find a place on the board to give us triple or quadruple points. Winning with us is like a seesaw. I get a couple of games ahead, then he comes backs, ties me and pulls ahead two or three games. The most anyone of us has been ahead is five games. When I get that many games behind, the adrenalin kicks in and I HAVE to catch up. Keeping scores since 2008 we ended this year with a tie. We each won 107 games with two tied games. In the ten years of keeping score, I have won one more game than he has. One more game in ten years. What a tight contest! So into the New Year we go! Suspect mounts! Will he be able to win more games than me in 2018? Will I pull ahead even more? For those who follow my blog and are tired of hearing about scrabble (which proves my addiction) I promise no more posts on this subject for a while (at least I promise I will try). So just a few scrabble jokes to end this blog and start another attempt to overcome my addiction. In Russia when a baby is born, the parents play a game of scrabble and the letters they pick up is the name of their child. I accidentally swallowed some scrabble tiles. My next movement could spell disaster. Well – my husband and I seem to be addicted to the game “Scrabble.” I have confessed my addiction in the past hoping that being totally honest would free me from this obsession with the game. Confessions of a Scrabble Addict! This summer we spent a lot of time in our hosta garden. That is another area where we seem to seek some kind of “brain reward” by seeing how many hostas we can plant in our back yard. Our entire back garden is full of hostas! We have close to 200 different varieties. That sounds like a lot – but there are over 3000 different varieties registered so it is really not that large a collection. We would try to get more varieties, but we have run out of yard space. While working in the garden (we also have roses, columbine and lots of day lilies) kept us busy this summer, it appeared we had conquered our game addiction. Instead of playing 15 to 20 to 30 games a month, we actually only played five to six games and there were even months we did not play at all. Then came the cold snap! We thought we were free! Then Old Man Winter arrived with bitter temperatures dipping below zero and wind chills readings 20 to 30 below. Since my husband has a heart condition and his doctor has told him not to go out in these bitter cold temps, we were stuck in the house. You can only watch so many movies! I baked an apple pie and we watched some old movies. But you can only watch so many movies before your brain dies. So out came the scrabble game. And we are hooked again! The month is not over and we have already started out 25th game! My husband loves to be able to play all his letters in one turn. In these 25 games, he has played all his letters 22 times. No matter how hard I try, I cannot keep up with him on this great feat. However, I am getting better as I have played all my letters 13 times this month. Do we sound crazy? Our kids insist when we die they will not have a visitation. Instead, in our honor, they will hold a scrabble tournament. Anyone else out there love scrabble? Are we the only nuts in the world? Hopefully with the arrival of spring, we will be able to shake free once again of this addiction. At least until winter returns in 2017.